The Fourth of July parade in Steubenville, Ohio included veterans of the G.A.R. The cabinet card photograph on the cover of this issue was taken about 1885. The editor provides additional comment on the new “Photos Sought” feature. While it appears to be very popular with readers, there were some issues that required clarification and therefore a necessity to move the due date for entries back to January 1, 1985. A wide variety of letters are given responses by the editor: a reader asks for a distinction between battle and parade dress uniforms, the descendent of a “Vignette” subject provides additional information on his great-grand-uncle, a historian makes some particular corrections to an article, and a reader gives further information about some unique footwear. The winner of the “Name That General” contest is announced as being Brian Pohanka, with a score of 134 out of 144. Some readers had great fun with the contest, although the feeling was not entirely universal. Regulations and Notes for the Uniform of the Army of the United States, 1917 in Parts 1 and 2 by Jacques Noel Jacobsen are reviewed. Continuing in a series of reprinted regulations, these two parts are considered to be important resources for the “serious student of the Great War period.” Part 1 describes the uniform regulations for officers, which were still produced by tailors, requiring more detail than the items included in Part 2, which covers the regulations for enlisted personnel, which were produced under government contract. A projected Part 3 will cover the huge numbers of changes to the regulations associated with this period. May 22, 1863 was the date of General U.S. Grant’s grand assault on the Confederate fortifications surrounding Vicksburg, and the men of the 33rd Illinois were waiting for the time for their assault – 10:00 a.m. – to arrive. With uniform jackets off due to the sultry Mississippi air, the men under the direction of Captain Isaac H. Elliott moved forward, and all but one of the men serving in Company E would ended up dead or wounded. The article gives the individual stories of many of the Illinoisans who fought in this Union debacle, and has images of seven of them, including two brothers who lost their lives as a result of the fighting that day. Thirteen photographic images of the men of Vermont illustrate the story of the men who turned back Pickett’s Charge on the last day of fighting at Gettysburg. The 2nd Vermont brigade, composed of the 12th through 16th regiments under the command of General George J. Stannard had not yet seen any fighting, spending most of their nine-month enlistment in the fortifications surrounding Washington. They were sent into Virginia as the rear guard of Major Gen. John Reynolds’ First Corps and made their way across Northern Virginia, through Maryland, and into Pennsylvania. The article describes the hectic quick move that the brigade had to make on July 1, being ordered not even to break ranks for water. The movements of the different regiments on July 2 are covered as well, with written accounts by Col. Wheelock Veazey, 16th Vermont, describing what that night and next morning were like. Many of his men slept through the artillery barrage that signaled the start of the actions on July 3, indeed he himself admitted that the previous days and 24 hours without any sleep made him consider sleeping too. It was while talking with Gen. Stannard that General Winfield S. Hancock was wounded in the groin. The Vermonters ended up attacking late support for Pickett’s brigades who came up behind them, Wilcox’s Alabamians and Perry’s Floridians, pivoting to hit the Confederates with fire and then capturing them with a full run. It was for this movement that Col. Veazey was awarded the Medal of Honor in 1891. Two images of Federal officers wearing “sporting” shoes made of light colored canvas with leather answers the question raised in the “Stragglers” section of the previous issue of Military Images: What are they wearing? It was a non-regulation shoe that was popular among hunters, yachtsmen, and (as was noted in one of the letters to the editor on page 2) croquet players. The author provides a short history of this shoe and its military application later in history, such as the combat boot worn by soldiers in Vietnam. The end of the Civil War saw the five Rodman guns that were to be installed to protect the port at Baltimore still not in place, although they would be by the end of 1865. 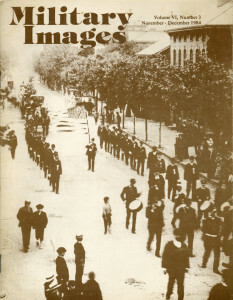 They remained there as a part of coastal defense and in 1903, Baltimore photographer Henry F. Rinn requested permission to photograph the huge 15” guns as they performed the salute for that year’s Fourth of July celebrations. The three images presented with the article show the guns in action, the largest muzzle-loaded artillery guns of the 19th century. One might think that this article would be about airplanes, but they only play a small part in this story. Sgt. Ward was at one point in aviation history the entire enlisted component of the U.S. army Aeronautical Division within the U.S. Signal Corps. While admitting later in life that he was not particularly fond of flight, he was an integral part of the balloon ground crew, with which he is shown in an image taken in 1907. Ward’s career took him in and out of various aspects of balloon service until his retirement in 1930. The first of three images for this issue’s “Stragglers” feature is of the 21st U.S. Infantry Regimental band at the Golden Spike ceremony marking the meeting of the Union Pacific and Central Pacific Railroads and the completion of the transcontinental railroad. A second image of C Troop, 6th Cavalry taken at Camp Grant, Arizona in the early 1880s shows a “veritable compendium of campaign dress in a period of transition.” Lastly, a photo postcard is shared of the Maine on washday, showing laundry out to dry on the ship’s rigging. The final image for this issue is of an unknown Yankee cavalryman. The sixth-plate tintype shows he is more than adequately armed for the work.